KeyShot 3 is Here. Animation, Materials, a Fresh UI and More. Today, we are extremely excited to announce the release of KeyShot 3. This release represents the most substantial update to our 3D rendering software, building on the simple process of creating amazing shots in seconds and introducing an all new, patent pending animation system to take your models to the ultimate level of visual sweetness. Along with that, we've made vast improvements to the user interface and the rendering workflow. Let's take a look at what's new in KeyShot 3. Animation in a real-time raytraced environment: Setup, edit, and playback inside realtime raytraced environment, just like when setting up a scene in realtime for still image creation. We've completely revamped the interface, cleaning up the heads-up toolbar and allowing you to dock it where ever you like. We've also made the asset library easier to navigate and manage with a folder based system, and in that making it easier to move materials around as well as import and export materials. You'll also find a redesigned Material Editor, allowing creation and editing of materials much simpler. Dockable toolbar: The main toolbar is now dockable - side, bottom, floating. The icons can be displayed large or small, with or without text. Dialog clean-up: All dialog boxes n the project window (formerly known as Options dialog) have been cleaned up to be more logical and therefore user friendly. Consolidation of environment and backplate tab: The environment and backplate tab have been combined into a single tab. In addition, the interaction between environment, color background and backplate has been largely improved by allowing to toggle between the three modes. Overwrite protection of content with visual feedback: When adding content to the existing resource folders, KeyShot will prompt the user with a visual comparison of old and new file should a file with the same name already exist. In-project material library: The in-project material library shows you all the materialsthat are currently being used in the scene. Material linking: When applying a material from the in-project material library, all objects carrying this material will change automatically as soon as the material on anypart is edited, or a new material is applied. The link can be broken via a simple right-click operation. Interactive preview of material in editor: Not only can materials now being viewed inrealtime on the model under the given lighting conditions, but also in the materialeditor. Move materials from one group to another: You can now easily move materials from one group to another. Export materials: In order to make sharing of materials easier, you can now export material groups to share with your team. This functionality will receive further enhancements in future updates. Import materials: You can now easily add materials from a material file that has been sent to you to any of your existing material groups. KeyShot 3 provides a huge amount of new materials. We've also included new lighting environments that will help to better light products independent of shape, material and finishes. 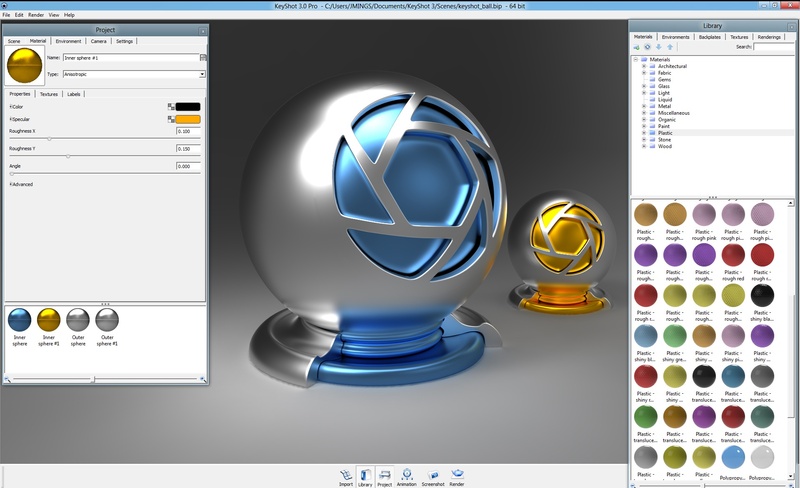 NX 8: Support for NX 8 and prior with the ability to control tessellation. Parasolid: Support for native Parasolid files including tessellation quality. 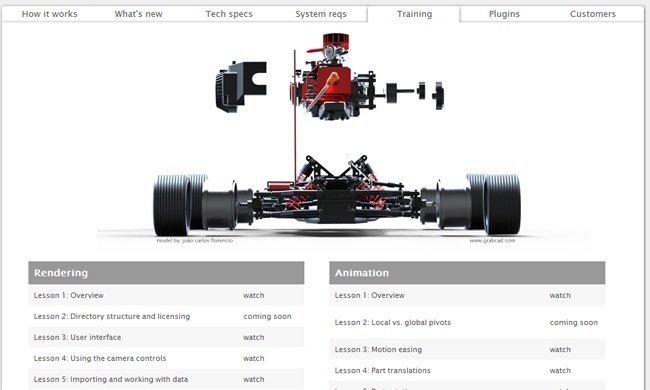 SolidWorks 2012: Support for SolidWorks 2012 and prior 32/64bit. The tessellation can now controlled upon import. SolidEdge: Support for SolidEdge ST4 and prior with the ability to control the tessellation upon import. You'll also find a new series of KeyShot tutorials that walk your through the entire process of rendering and animating models in KeyShot. Beginning with an overview that explains the fundamentals of KeyShot and how environmental lighting works all the way through achieving the best results for materials, textures and lighting with special tips on rendering and camera settings throughout. To see the complete list of new features in KeyShot 3, just visit the What's New section or check out some of the training videos mentioned above. You can also download KeyShot 3 to see all the new features for yourself! KeyShot 3. Like bringing a Kalashnikov to 9th century sword fight ...and other user comments. Rendering in KeyShot. Step-by-Step Rendering and Animation Lessons.